I think this is the most important piece of writing I have ever been involved in. International negotiations can and should be designed in way that takes into account the science of cooperation. Reciprocity is the key to realigning self-interests and promoting cooperation. "Individual commitments" and "reviews" will not solve the tragedy of the commons. A common commitment ("I will if you will") can. What sort of common commitment would work best? We argue that a global carbon-price commitment could yield a strong treaty, especially if coupled to Green Fund transfers, incentivizing low-emitting countries to support a high carbon price. 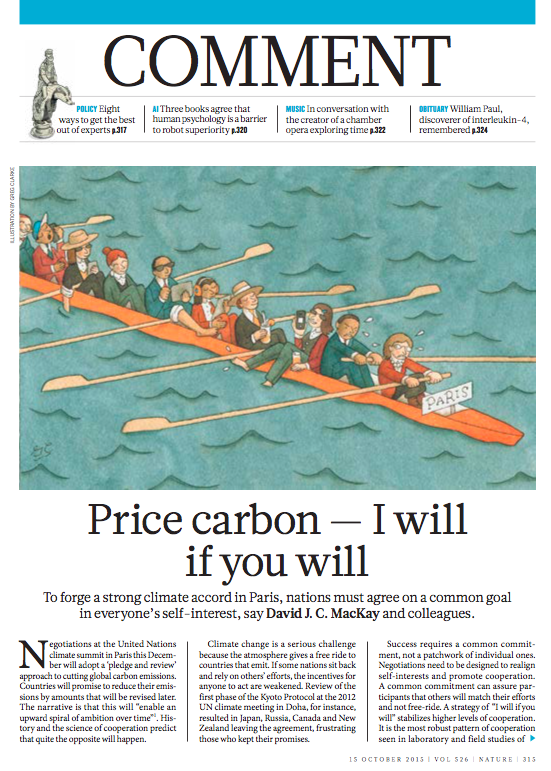 Read the comment on Nature's website, and for further details see carbon-price.com.